Are you looking for tree removal in Morris County, NJ?. Amazing Tree Services is dedicated to providing Morris County home and business owners with a safe environment on their property. Our years of experience and prompt service provides our tree experts with the ability to remove hazardous trees from your property without delay. If you’re having problems dealing with birds, squirrels, raccoon or bugs because of trees on your property, our tree professionals will help with that. It’s true that many critters take up shelter in trees. We’ll remove the trees in a way that doesn’t harm the wildlife while still giving you a peace-of-mind. Sometimes tress grow, expand and impede onto properties. In some scenarios, improper tree removal can really damage a property. Our tree experts will make sure that doesn’t happen. From stump grinding to the highest branch we’ll properly take care of the tree on your property. Timing can be crucial when removing a tree. If you think that a tree is causing any damage, contact Amazing Tree Services and one of our tree professionals will be happy to help you with a a free tree service estimate. At Amazing Tree Services, our professionals will work efficiently and safely to make sure your needs are met so that your property stays safe and beautiful for many years to come. We understand how to deal with unwanted or troublesome trees, and our emergency tree removal is available with 24/7 service to keep you and your property safe. For more information about tree removal in Morris County, NJ call Amazing Tree Services today. 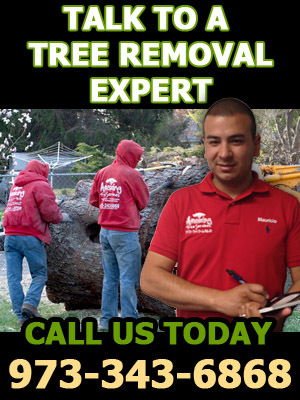 Amazing Tree Services- your trusted source for tree removal in Morris County, NJ!